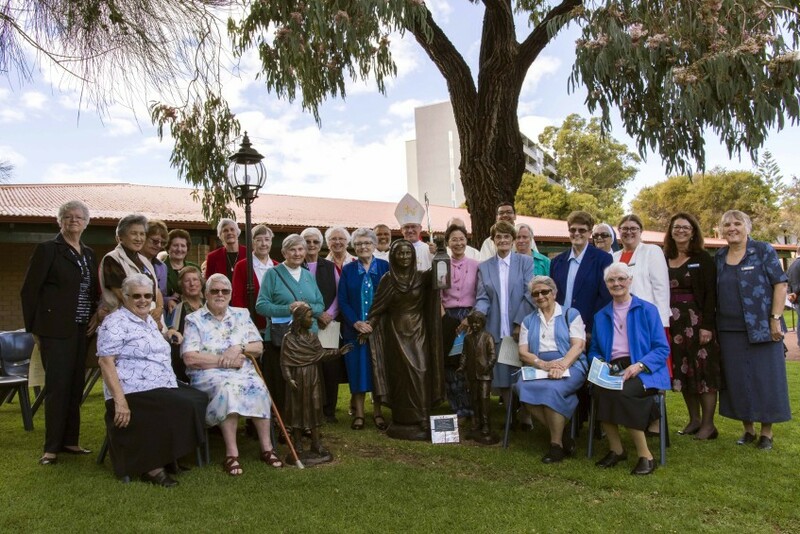 The sisters of the Presentation Order together with Archbishop Costelloe paying homage to the newly erected Nano Nagle statue in the Presentation Garden. Photo Natashya Fernandez. 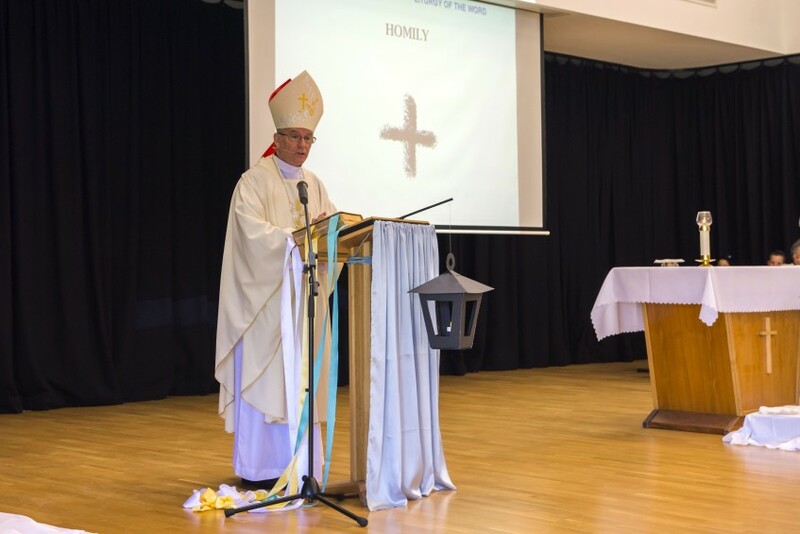 The Iona Presentation Primary School community last week came together to commemorate the handing over of the school to Perth Archbishop Timothy Costelloe SDB. The handing over marks 110 years of responsibility for the school by the Presentation Sisters. 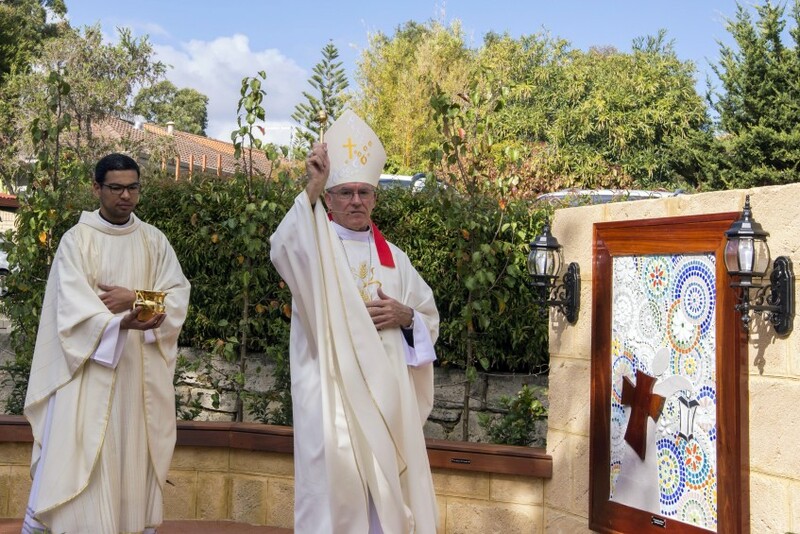 The occasion was marked with a Mass celebrated by Archbishop Timothy Costelloe and concelebrated with Frs James D’Souza, Chris Ross and Rodrigo Ponte, in addition to the blessing of a ‘Presentation’ Garden and abstract mosaic. Archbishop Costelloe blessing the Presentation Garden and the Mosaic, an abstract image representing Nano Nagle and the Presentation Sisters. Photo Natashya Fernandez. Archbishop Costelloe thanked the Presentation Sisters for the wonderful gift of their presence at the school over many years and the Church in Western Australia. “I do want to say at the start, seeing that with so many of the sisters here today, we need to make a big fuss of them. “To show them how grateful we are for all the wonderful gifts they have given, especially to this school, the big school up the road and also to our church in WA,” Archbishop Costelloe said. Special guests included Catholic Education Western Australia (CEWA) Director of School Improvement Dr Tony Curry, Principal of Iona Presentation College Mrs Anne Pitos, past Principals of Iona Primary Sr Maureen Moynihan and Ms Christine Walsh and representing the Iona Primary School Board, Mrs Simone Warden. Principal Jennifer Anderson saved the best for last by introducing the Presentation Sisters who were central to the celebrations. “I am most honoured to welcome Sr Kathleen Laffan, Congregation Leader of the Presentation Sisters in Western Australia and the many Presentation Sisters who have come to celebrate with us today,” she said. Special acknowledgement was given to the traditional owners of the land and symbolic offerings were brought to the front by staff and students to honour Presentation Order founder, Nano Nagle. It was a poignant day for many present at Iona Presentation Primary School, in particular the Presentation Sisters who after 110 years are handing over their responsibility for the school to Perth Archbishop Timothy Costelloe SDB. Photo Natashya Fernandez. In his homily for the occasion, Archbishop Costelloe enlightened staff and students with historical information about the school and the founder of the Presentation Order, Nano Nagle, who is remembered for her faith, commitment and dedication for the poor and abandoned. “It is a school full of dedicated and caring teachers and enthusiastic and joy-filled students and we have a wonderful history in this school which has been shaped so much by the Presentation Sisters,” Archbishop Costelloe said. “Today especially, as we celebrate this Mass in which we have a chance to come closer to Jesus and, through him, closer to each other. To reflect on just how important the Presentation Sisters, and the spirit which animates them has been and continues to be for this school,” he said. “When the Presentation Sisters decided to establish a school in this part of Perth they hoped that, like the island of Iona, the school would also be a place where people came to know and love Jesus and from where people, like all of you, would go out and, wherever you went, share the good news about the love of Jesus with everyone. “This desire to share the love of Jesus with others was exactly what Nano Nagle decided to do with her whole life. Because you are all part of the Presentation family, you too are called to carry the light of Jesus to others. “Maybe you won’t have a lantern in your hands, but you can all carry the light of Jesus’ love in your hearts. And when you carry it in your own hearts, you are able to give it as a gift to others. “Be proud to be a member of the Presentation family, be grateful to the sisters who have kept this wonderful light alive in our Church for such a long time, be brave and strong in doing your part to keep Nano Nagle’s lantern burning. And like Nano Nagle, let Jesus be the light of your lives too,” the Archbishop said. Iona Primary School Board representative Simone Warden said she was blessed not only to be present to reflect on the life and legacy of Nano Nagle, but also to give thanks to the Presentation Sisters of WA. “It is through their dedication and service to the community that we are all here today. That we can be in this remarkable place of learning,” Mrs Warden said. “We are so fortunate to have the message of Nano being lived through the Presentation Sisters today - keeping it relevant and alive in the Iona school community and instilling these values in young presentation people now and into our future,” she said. Pastoral Carer and the only remaining religious sister at the primary school, Sr Catherine Warner, has been at the school for six years and a Presentation Sister for 49 years. Sr Catherine worked with the staff to make the day a memorable one for the community. “It was a great day to acknowledge the contribution of the Sisters and their journey with the staff, students and parents. I will continue in my role as Pastoral Carer at the school and use the Seasons for Growth Program to help children deal with grief and loss in their lives and to be a Presentation presence within the school,” Sr Catherine said. 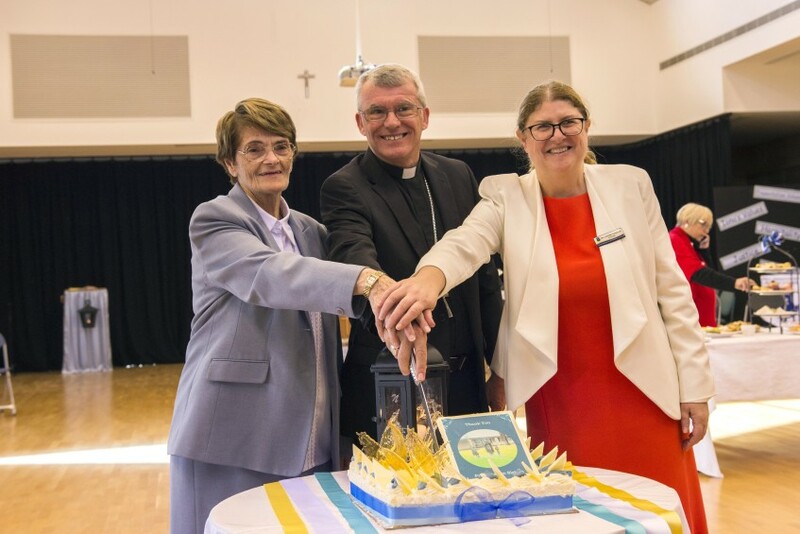 Congregation Leader of the Presentation Sisters in Western Australia Sr Kathleen Laffan with Archbishop Costelloe and Iona Presentation Primary School Principal Jennifer Anderson participating in the celebrations. Photo Natashya Fernandez. Presentation Sisters Western Australia Congregation Leader, Sr Kathleen Laffan, said that it was a privilege to be present at the Mass and celebrations. “We are here today to celebrate the 110 years that we have journeyed together, presentation sisters, students, parents and the wider community. All in the footsteps of our found, Nano Nagle. “I hope the newly erected statue of Nano will be an inspiration to all students, staff and parents in the years ahead. “Today as we hand over our presentation responsibility for the school to Archbishop Costelloe, we want to assure you students, parents and many friends that we will hold you in our hearts and prayers as we go forward. “We have full confidence in you, the staff, that the message of Nano will remain alive and active, that you will continue to impart the message that God loves each of us no matter what the circumstances of life. “May you with the support of the parents continue to help the students to see and live the value of service to others that Nano demonstrated in her life,” Sr Laffan concluded.